A drink with electrolytes replaces essential minerals after a heavy-duty sweat session. An intense workout is one reason you might need an electrolyte drink, but you may also need one after losing a lot of fluids during an illness or on a particularly hot and humid day. Dozens of electrolyte drinks are available, but many commercial products contain significant amounts of refined sugar or artificial sweeteners, chemical preservatives, emulsifiers and artificial colors and flavorings. The healthiest electrolyte drinks are usually those you make yourself because you control the ingredients and know exactly what you're getting with every sip. Electrolytes are minerals, including sodium, chloride, potassium, magnesium and calcium, that assist in proper muscle function, maintaining fluid balance and supporting neural activity. When you lose a lot of fluids in a short period of time, you can become temporarily deficient in these nutrients. Workouts done in extremely hot temperatures, at a very high-intensity or for periods lasting 60 to 90 minutes or longer are likely to require electrolyte replacement drinks. Electrolyte drinks made with all-natural ingredients with names you can pronounce and recognize are usually the healthiest options. Choose plain bottled water with added electrolytes, for example. Coconut water also naturally contains numerous electrolytes but can be low in sodium, which is one of the most important electrolytes necessary to replenish especially after exercise. Watch for drinks with chemical sweeteners, including acesulfame potassium and aspartame, which the watchdog organization Center for Science in the Public Interest names among the ingredients to avoid. Artificial colors -- particularly blue 1 and 2, caramel coloring, citrus red 2, green 2, orange B, red 3 and 40 and yellow 5 and 6 -- should also be avoided when seeking the healthiest electrolyte drinks. The healthiest drinks also contain no brominated vegetable oil, which helps keep the drinks clear and emulsified. This ingredient is banned in Europe and Japan and has been linked to health concerns. 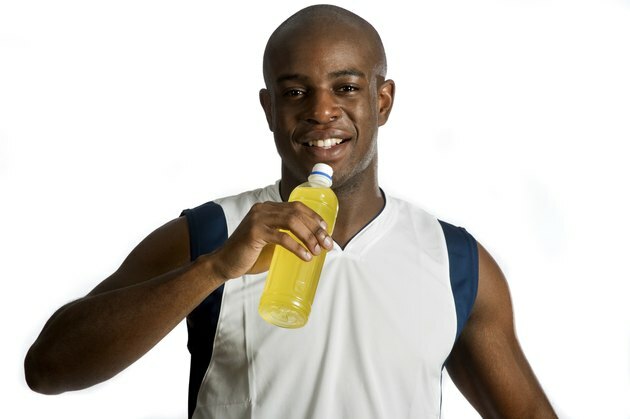 Some electrolyte drinks contain carbohydrates to provide you with energy during your workout. Avoid those with high-fructose corn syrup or other highly refined sugars. Instead, look for natural juice flavorings or honey. For a healthy electrolyte drink with identifiable ingredients, mix together fruit juice -- such as potassium-rich citrus juice or tart cherry juice -- with honey, water and a pinch or two of table salt. Brendan Brazier, former professional triathlete and author of "Thrive," recommends making a drink with coconut water and agave and adding sea salt to taste. A mixture of apple, celery and lemon juice or a blend of banana, almond milk and kale can also offer fluid replacement along with naturally occurring electrolytes, such as potassium and magnesium. Marketers make you think you need a drink to replace electrolytes, but these minerals are present in many foods. Include certain foods in a recovery meal, and accompany it with pure water for rehydration; you'll more than adequately replenish electrolytes. Dark green vegetables and nuts offer magnesium; plain table salt provides sodium and chloride; fruits, vegetables and yogurt provide potassium; and dairy products, nuts and greens offer calcium. What Drinks Are Diet and Have Electrolytes?